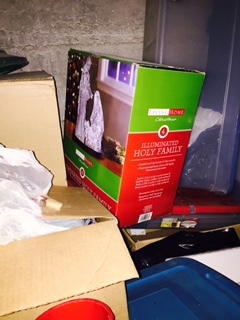 A little later, I’m going through the basement to find a few decorations to bring upstairs. Mining through the cluttered corner, I discover a beautiful homemade nativity set that a friend gave me several seasons ago. It rocks. But it is small. As I removed that box, I noticed one tucked way against the basement wall that I had forgotten all about. 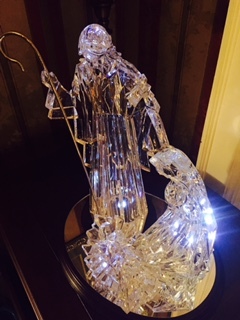 A frosted crystal-style lighted set of Jesus, Mary and Joseph. How could I have blanked on this? I love putting this up. I didn’t forget to go out and get a tree. I didn’t forget Christmas shopping. I didn’t even forget to read “Advent Conspiracy” about giving more and spending less. Suddenly, I got what I wanted: Jesus in my face, quite literally. It was as clear an analogy as I had ever experienced. My metaphor-du-jour. Perhaps I am not alone in this business of Jesus getting shoved to the back of the basement during His own birthday party. I actually take great consolation in this lesson. Even when I “misplace” Him, He is gracious enough to display His birth right before my eyes in the darkest place of my home. Now that’s a face you can’t forget.